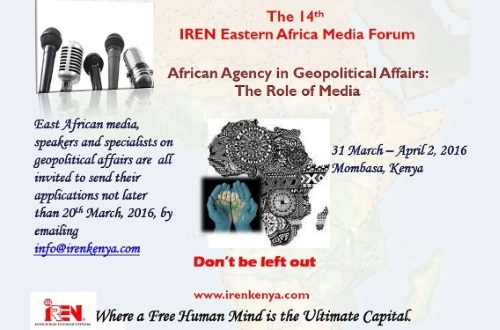 The IREN Eastern Africa Media forum is one of IREN’s key forums that targets media practitioners for annual brainstorming sessions on business, governance and other developmental issues. For the last eleven years, IREN has trained over 500 journalists and communicators from Kenya, Uganda, Tanzania, Rwanda, Ethiopia, Ghana, Zambia and South Sudan who cover business, governance and other developmental issues. The IREN Eastern Africa Media Training aims at exposing media practitioners to factors that influence events in the world and to principles of wealth creation, and to promote coverage of development economic issues in Eastern Africa media outlets. (2014) Africa Rising: Myth or Reality? (2011) Is Eastern Africa Ready for China-India and Europe? (2009) Africa Resources Conflict: Whose Interest does the Press Serve? (2003) World Trade Organization and Africa.